One of the many rewards of being a stay-at-home-dad is that you are allowed to operate on a totally non-normative schedule. Grocery stores are always empty, you don’t have to wait to get an oil change, and it’s pretty easy to be first in line to buy concert tickets. So when Belle and Sebastian went on tour in support of their last album, Write About Love, we were lucky enough to get seats that were as close to the stage as we’ve ever been. I expected to settle into the plump red chairs of the historic hall, to be softly caressed by twee darlings who would rarely look up from their own shoes. That wasn’t what happened. We never sat still; neither did the band. Lead singer Stuart Murdoch, perched on a speaker, serenaded the front row, contemplated eloping with the two young women who brought a sign asking if he would, and threw out autographed Belle and Sebastian footballs to children in the audience. (We almost brought our daughter but felt she was too young for an indoor show so late at night, but, damn, we could have had a football!!!) When it came time for “Boy With the Arab Strap,” he invited couples on stage to dance along and then gave them medals for participation. It seemed clear to me what Belle and Sebastian wanted. 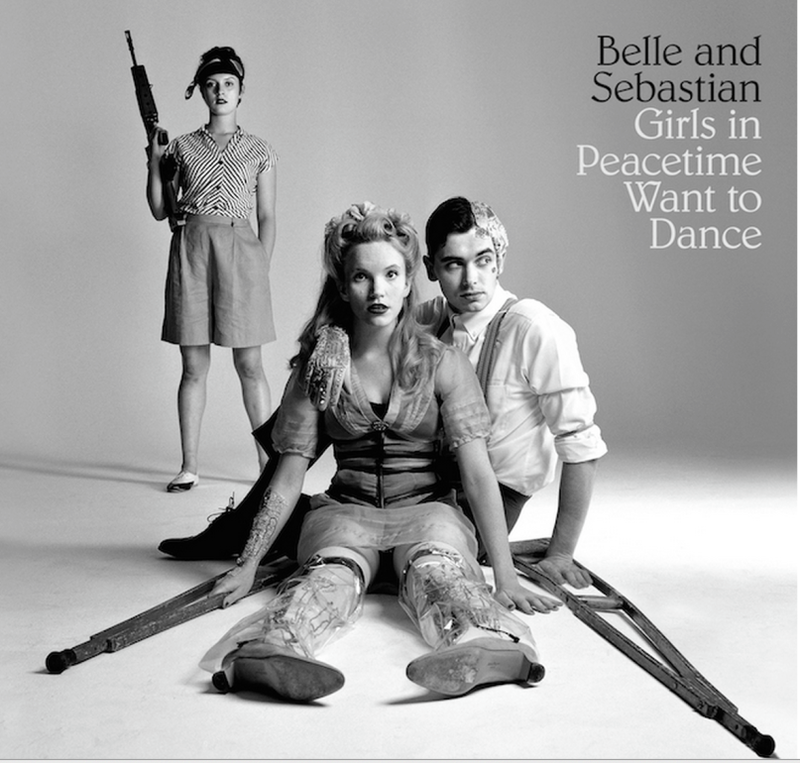 It’s not just Girls in Peacetime [who] Want to Dance; Belle and Sebastian would like to boogie a little bit too. The first song lets you know where you’re headed. “Nobody’s Empire” feels like pretty classic B & S, a happy sounding wordy song about being kind of sad, but it’s moving a little faster somehow. An even more reflective “I’m a Cuckoo,” except that in “Cuckoo” Murdoch speaks entirely in the present tense. There are more than a few good songs on this record, and this one is easily my favorite. Belle and Sebastian has always been aware of the things that might keep a person hidden away from the world, tucked under the covers with a handwritten journal. But the man who once offered himself to a God who maybe didn’t love him back has turned a corner. I don’t think it’s a coincidence that “Nobody’s Empire” is sung in the past tense. Murdoch survived, and now he’d like to move around a little. When we were in high school we would buy these Soul Coughing CD singles that had remixed versions of their songs as “b-sides,” and I thought about those more than once listening to Girls. This could almost be a Belle and Sebastian remix album, for the days when you’d like to dance away your sadness. Even songs that start out slow don’t stay that way for long, as “The Everlasting Muse” slinks through a quiet, measured intro and verse before going into a full Eastern European Gypsy chorus. Just like at their concert, the band seems committed to having some fun on this record. “Perfect Couples” might not be the best song on the album, but it is the closest thing Belle and Sebastian has ever done to a theme song for a Portlandia parody of Bosom Buddies starring Miranda July and Carrie Brownstein. They’ve spent enough time in bed. Time to get up and dance. Belle and Sebastian is my go-to band for the days when I need to be happy and relax, when I need to use words to know that it’s all going to be okay, and, ideally, I’ll pair them with a nice sativa-leaning hybrid. I want to be focused, upbeat, and content, but I need those effects to be regulated, spread out over time; some pure sativas can make my heart and head race. If you can find it, Mob Boss, from Grindhouse Medical Seeds, would serve as a nice complement to Girls in Peacetime Want to Dance. A relatively new strain, Mob Boss debuted in 2009 and is a combination of Chemdawg D and Tang Tang. In our experience, this strain exhibits some variation from batch to batch, but a good Mob Boss will alleviate stress, provide a bit of euphoria, and allow you to fully appreciate all the ways in which life is kind of hard but will give you reason to be out of bed and dancing around (at least your house) eventually. Posted in Arts & Literature, Reviews, Strains and tagged belle and sebastian, boy with the arab strap, cannabis pairings, girs in peacetime want to dance, i'm a cuckoo, mob boss, music & marijuana, sativa-leaning hybrid, stuart murdoch, write about love.